Out of place but not out of attractions, Isuzu’s FVY1400 Agitator takes on a demanding course and wins a hitherto reluctant fan. Matt Wood writes. 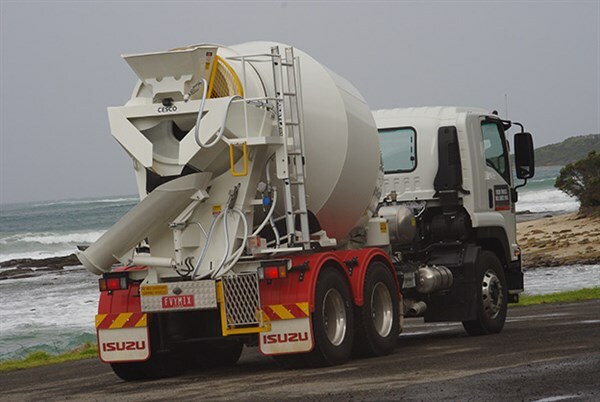 When I was offered a drive of Isuzu’s new ‘built for purpose’ FVY1400 Agitator, I then had to think of something to do with it, other than pour concrete. So, I figured that, in the best tradition of motoring journalists everywhere, I’d don my driving gloves and find a ‘driver’s’ road, a twisting scenic road that would really put the Agitator through its paces, and maybe even let me pretend I was driving an Audi R8, almost. Victoria’s Great Ocean Road would have to be one of Australia’s most enjoyable drives. Judging from the sheer number of motorcyclists and sports car enthusiasts that converge on the winding, scenic coastal drive to do battle with the campervans and backpackers, it seems that a lot of people agree. In fact, a recent newspaper poll had the Great Ocean Road rated as the best drive in the country by 48 per cent of respondents. And, indeed, the road that was carved out of the cliffs along the Shipwreck Coast by returned World War I veterans does provide a panoramic and dramatic backdrop as the ocean batters the wild rugged coastline. Think of it as a man and his cement mixer battling the elements. So what, you might ask, is the big deal about the Agitator? Well, in the past, if an operator wanted to use the 6x4 FVY1400 as an agitator, the chassis would have to be shortened and other minor mods would have to be taken care of locally, such as fitting the power take-off unit (PTO). The new Agitator-friendly chassis comes straight out of the box ready for a bowl to be fitted and go straight to work. In an application where tare weight savings are important, the new model also comes in lighter than its other Isuzu siblings, thanks in part to features such as aluminium wheels as well as a lighter chassis. The agi chassis tips the scales with a dry weight of 6,470kg. More than just a lighter, shorter chassis, the agi also comes standard with a factory fitted Powauto ‘live drive’ PTO as well as Dana drive shafts and Hendrickson air-bag suspension. The SITEC series III 7.8-litre engine under the cab operates at a very civilised noise level, and the PTO is only marginally louder. The six cylinder turbo diesel offers 295hp (221kW) of power at 2,400rpm and 981nM of torque at 1,450rpm. Settling into the Isuzu agitator was pretty straightforward. The truck differs little from the rest of the Isuzu range. Large analogue gauges provide the usual speed, rpm, and fuel level readouts along with air pressure info. 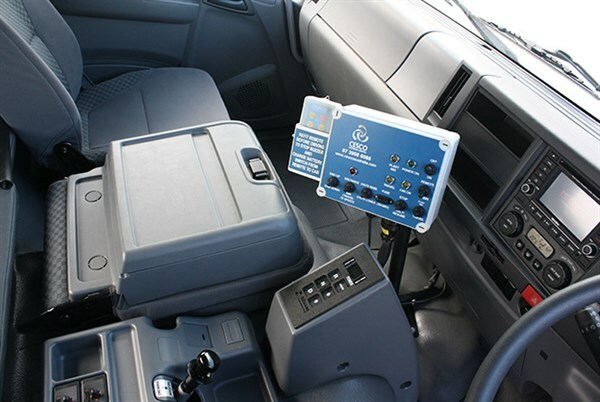 A small digital menu provides trip info more detailed engine information as well as diesel particulate diffuser (DPD) regeneration info for the exhaust gas recirculation (EGR) system. When it came to parking, it was easy. With the reverse camera mounted near the top of the barrel, I had a commanding view of the space behind the truck with the picture displayed on the screen of the dash-mounted Navteq multimedia unit. The inbuilt micro phone is a great idea, especially if you’ve got someone guiding you backwards into a site. When someone yells ‘stop’, you’re definitely going to hear them before you run over any formwork. 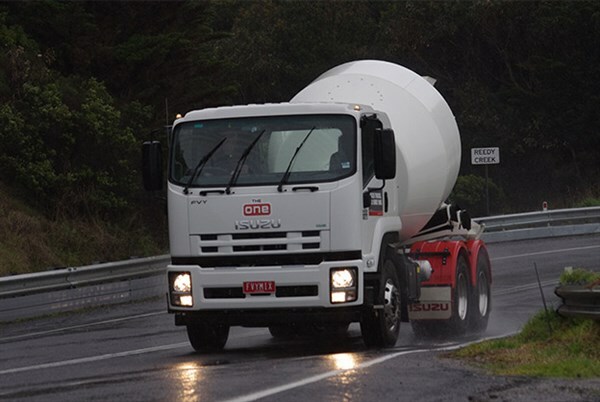 The test truck had been fitted with a 6.5 cubic-metre CESCO agitator bowl and the bowl had been counterweighted with gravel to give a gross weight of 19 tonnes. The CESCO installation was a neat one with the pedestal mounted control panel affixed to the cab floor within easy reach of the driver. It did, however, foul the slide out cup holders in the dash panel so alternate arrangements would have to be made for caffeine storage. Before departing, I was instructed to make sure that the bowl was rotating at all times while I was driving, as this apparently prevents the barrel rollers from being damaged. Once again, thankfully parked, I had one of my ‘What happens if I press this?’ moments when fiddling with the agitator control panel. All of a sudden, the engine rpm jumped by 1,000rpm and the bowl started to rotate furiously in the opposite direction, threatening to spew tons of gravel onto the suburban cul-de-sac I was parked in. Panicked and ashen-faced, with visions of me spending the rest of the day shovelling gravel back into the bowl, I managed to find the ‘off’ switch and breathed a sigh of relief as the barrel slowed, stopped and started to rotate in the appropriate direction. I can’t see anyone giving me a guided tour of a NASA facility anytime soon; too many buttons, too much temptation. One of the most striking things about the Isuzu agitator is how quiet it actually is. Agitators have never been the quietest piece of machinery on the road, the PTO whine competing with the roar of the engine feeding horsepower to the Allison transmission, along with the crunch of wet cement generally creates one hell of a din. The Isuzu, however, is remarkably quiet inside and out. As I hit the Geelong freeway heading for the coast, I must have looked like a bit of a goose, a pretend agi driver with a pretend agi load, wearing a white shirt. The Isuzu will actually sit on the 100km/h freeway limit but, with its 6.43:1 drive ratio, I felt like I was flogging it. The engine felt a lot happier with the tacho needle sitting at around the 1,800rpm mark, giving me a road speed of around 85km/h, plenty fast enough for a cement mixer, really. 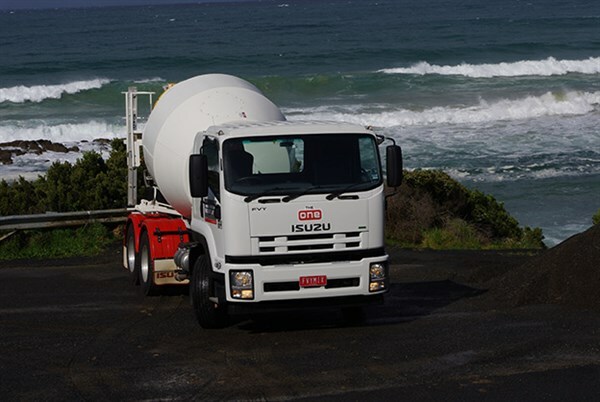 As I passed through Anglesea and Aireys Inlet on the Surf Coast, the cement mixer proved quite easy to live with, the terrain had been gently undulating, and the road relatively quiet. The 221kW SITEC engine kept the wheels turning and I’d locked out the top two gears of the Allison transmission. This kept the revs in the top half of the green torque band of the tacho, where the engine seemed happiest. But it wasn’t long before the road started to twist and climb dramatically with 40km/h switchbacks; I’d officially arrived at the start of the Great Ocean Road. After speaking to some experts in the agi field, i.e. someone who’d actually driven one before, I’d been advised that an agitator is not the most stable vehicle in the world and to take it easy while driving one. And I have to agree, the high centre of gravity due to the location of the bowl on the chassis certainly lets you know that it’s there. But that being said the four-bag Hendrickson HAS400 suspension kept things predictable, and more importantly upright, quite without any surprises. I arrived in the tourist town of Lorne and promptly set to finding a spot to park an agitator in the main street. I needed another caffeine top up. It would be fair to say that the vehicle made an incongruous sight sitting in the main drag beside the beach. Heading out of Lorne towards Kennett River, the weather started to close in again, I’d officially chosen the coldest, wildest day of the year to head down the coast. But the Isuzu remained unfazed as I flicked on the heated mirrors and kept the windscreen wipers ticking over, both of which remained clear and easy to see out of and through. In fact, on a particularly twisty section of the road that had me lugging along at around 20km/h, I happened to glance in my mirrors, and was greeted with a sight that immediately brought a rather evil smile to my face. It was a caravan, and the person towing the caravan seemed to be getting impatient because they were being held up by a truck. "Well, Arthur and Mavis," I thought as I once more glanced back at the (bad pun warning) agitated caravan driver, "here’s one for the books, a caravan stuck behind a truck." Maybe I should have stopped and offered them a cup of concrete. The 221kW SITEC engine wasn’t exactly a powerhouse but it performed well in front of the Allison box. By locking out the higher gears when climbing and descending the whole package performed well. Although I certainly wasn’t going to be breaking any land speed records. To be fair, though, an agitator of this size doesn’t really stray too far from home and will most likely spend the bulk of its time pottering around city and suburban streets and maybe even new housing estates. The pneumatically actuated exhaust brake was virtually useless at this kind of weight but, when switched on, it did encourage the transmission to down change earlier at higher rpms which helped markedly in the braking department. The dual circuit, full-air S-cam brakes also helped keep things in check in the stopping department. As I turned around and headed back towards town, the coast stretched out before me wearing its cloak of ocean foam and salt spray. The buffeting wind off the ocean rocked the agitator lightly as I cranked the wipers and the heater up a notch or two while negotiating the hairpin turns carved into the granite bluffs. 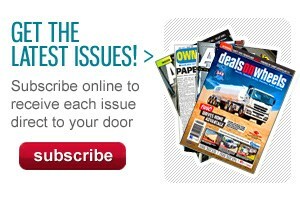 Is Isuzu’s new agitator the ultimate freedom machine? Well, no, but it does make a good walk up start as an agitator and in fact, without too much modification, it wouldn’t be too hard to see the agitator chassis also being adapted for work as a waste compactor or a "one-armed-bandit" waste truck. But as payloads have only seemed to increase in the construction sector, what the agitator really needs is a load sharing twin steer configuration to really mix it with some of its higher GVM, multi-axle competitors. 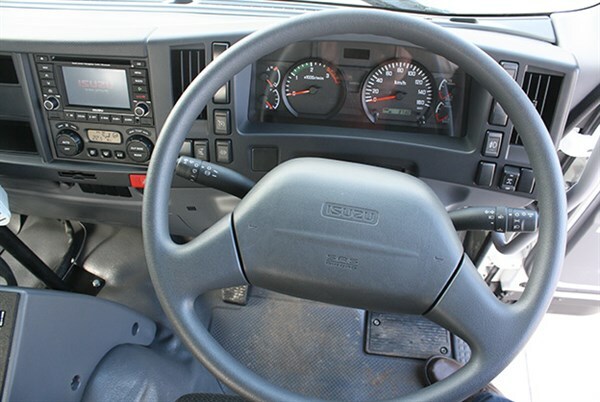 The well-equipped easy to get in and out of, no nonsense cab is well placed for agitator duties, comfortable but easily cleaned with plenty of room for the gear a driver will need for a day’s work. It’s the kind of truck you can just hose off at the end of the day and walk away from without your ears ringing or your back aching. After putting 380km on the clock, I found that the agitator may be a pretty poor substitute for a sports car, but as an entry level agitator the FVY1400 will no doubt prove to be every bit as bullet-proof as most have come to expect from the Isuzu brand name. Engine: 7.8-litre STEC Series III six cylinder turbo diesel. 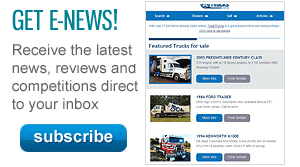 Click here to find new specs for Isuzu trucks.